Curly in the City: can I? About a 2 weeks ago I 'pinned' this image, because it is awesome! It is perfect for the Hubs and I. Its true, we both comment on how riding alone isn't the same...and riding with others isn't either. We have our rythm - I lead he follows - I yell at cars he's my back-up! Biking is one of my favorite ways to spend a day with the Mr. So, I searched high and low for a print of it, I wanted to surprise him with a print of it for the house. I couldn't find it (well not easily at least). Well guess what? He came home with this exact design printed on a shirt for me last night! He is a total keeper!!!! I didn't even tell him or show him, I wanted to get it for him. Well he won! I sure hope to do some of the above this weekend! As well as sew, and lounge poolside....this summer is turning out fantastic!!!! Any fun plans on your agenda? Happy FRIDAY DOLLS!!!!!!! So cute lady! He is a keeper. Have a great weekend. Awww love thoughtful husbands! happy friday! So nice to be so in sync! I love that you're so in line with each other. My husband and I both got bikes in the last couple months, and we've had so much fun riding them togehter, too. So sweet, you are one luck lady! how sweet! what a perfect pair you are! That is SO cute! I love it. Bike rides with nice boys are the best. SO cute! 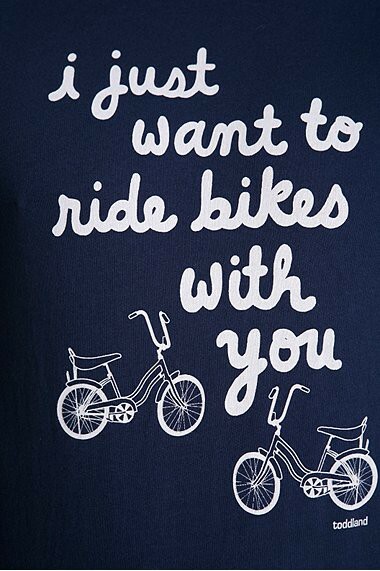 I love riding bikes. My husband isn't SO into it so I mostly ride with my friends, the other day our biker gang reached6 of us! have a lovely weekend! That is so cute! I totally agree on the poster! How cute! You two are definitely on the same page! Aww, so sweet!! What a cutie. this is too cute! what a nice guy. he knows you so well!